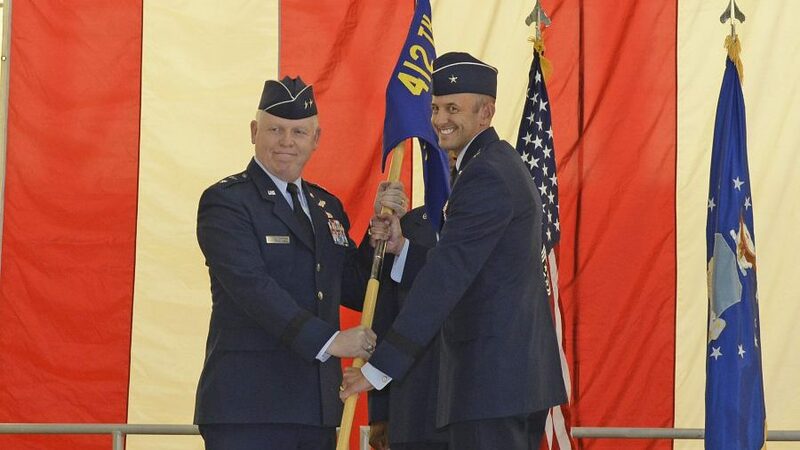 Maj. Gen. David Harris, Air Force Test Center commander (left), passes the 412th Test Wing guidon to Brig. Gen. E. John Teichert III, signifying the transfer of command of the wing, July 18 in Hangar 1600 at Edwards Air Force Base. Several months ago I was delivering a speech to a group of patriots in our nation’s capital when I suddenly became ill and collapsed. The following day, as I was recovering in the cardiac wing of a nearby hospital, I received a visitor — Col. John Teichert, then the commander at Joint Base Andrews. I was a bit puzzled and surprised to see someone of Col. Teichert’s stature standing in my hospital room — seeing how I did not know the man. I was particularly moved by the colonel’s kindness and his compassion — a brother in the Lord who took time out of his very busy schedule to pray at the bedside of a stranger. So you can imagine my surprise when I received a news release from the Military Religious Freedom Foundation calling for the arrest of now Brig. Gen. Teichert — the new wing commander at Edwards Air Force Base in California. The Military Religious Freedom Foundation is an organization that trolls military bases in search of any public display of the Christian faith. The group is typically triggered by Nativity scenes and Bibles placed on Missing Man tables. The website encourages “Bible-believing Americans to take time to specifically pray for our nation at lunchtime every day.” It also features a prayer list — including among others President Trump, Vice President Mike Pence, Congress and the military. The Military Religious Freedom Foundation claims to represent 41 people at Edwards Air Force Base who are allegedly offended by the general’s personal website. “Brigadier General Tiechert’s disgraceful, illegal and brazen promotion of his personal flavor of his weaponized version of Christianity represents one of the worst and most egregious cases MRFF has ever encountered in its 13 years of First Amendment civil rights advocacy,” Weinstein said in a prepared statement. Weinstein went on to allege the general’s website violates the Uniform Code of Military Justice and demanded that Teichert be investigated, prosecuted, convicted and punished. “General Teichert should be doing time behind prison bars, not commanding a Wing wearing a General’s stars,” Weinstein said. The Pentagon has not responded to my inquiries about Weinstein’s complaint, but the allegations are so outlandish they deserve no response. First Liberty Institute is one of the nation’s most respected law firms handling religious liberty cases. It is not representing Teichert. “Bigoted demands that an officer be thrown in military prison because he prays for others should be rejected out of hand,” First Liberty Institute’s Berry said. During the Obama administration, Weinstein once bragged about having a hot line to the Pentagon. It’s beyond time for the Trump administration to disconnect the number. It’s time to put a stop to these vile and hateful attacks on Christian members of our military. Demanding that a general be imprisoned because he prays? Calling him an extremist predator? Outrageous! Originally published at ToddStarnes.com. Reprinted with permission.